News of the extended network of faculty, alumni, students, visiting researchers, and mission partners is regularly updated, and some of the big ideas or major events in Global Christianity are covered in the CGCM News. The CCARHT Summer Symposium is up and running. Here at the Centre we are busy assembling a powerful set of speakers to address the themes evoked by the Several Rs of Trafficking . How are people Recruited into trafficking relationships and what role does Awareness Raising play if any? What are the Rights of those who are gathered out of the Mediterranean as they leave the shores of Libya in the torrid seascape of the Law of the Sea? How are we protecting those who Register their desire for asylum as ‘outsourcing’ of European border control pushes southwards? What are the challenges for those who are Recovered from Trafficking networks and locations of exploitation for long term psychological recovery? How are people who have experienced Trafficking Abuse Represented and incorporated into protective and recovery processes? What role are Religious communities playing, and what are some of the Risks and Opportunities here for governments to harness as well as secure appropriate protection and guidance. Is there a Race card which is playing through counter trafficking work and inhibiting appropriate safeguarding by States? How does Ethnicity and Race work in the processes of vulnerability to co-option and exploitation?. What are the Risks and Rewards which face those who get involved in Trafficking ‘entrepreneurship’ and why does it matter for governments to understand these dynamics? Just some of the questions being explored by leading academics, along with government advisers and policy makers, prosecutors and police, gathered from the UK, Europe, North Americas, Asia and Africa for this annual exploration into some of the prevailing and tough questions which require further exploration and enquiry, and some onward Recommendations . Want to be a part of the thinking and deliberations of this significant Think Tank event packing a global punch? Register now while the Early Bird special is on and get your team set up for its work into 2020 with a powerful network of colleagues who will be assembled at the Judge Business School in the University of Cambridge for the week of 1st – 5th July 2019. Register today for the Symposium here and let your colleagues know by forwarding this link . Fuller Seminary announced that Amos Yong (’99) has been named to serve as dean of both the School of Theology (SOT) and the School of Intercultural Studies (SIS), marking a historic new structure for the institution, effective July 1. Under one dean, the coordination and integration of curriculum and degrees in SIS and SOT will be more conducive for student needs and learning. This revised structure provides the strategic cohesion Fuller needs in the next season of the life of the seminary. Yong’s previous role as the director for the Center for Missiological Research, his extensive missiological expertise, and his work as a theologian make him uniquely suited for this role as Fuller revises its curriculum to nimbly, responsively, and adaptively address changing needs of our students and the world. 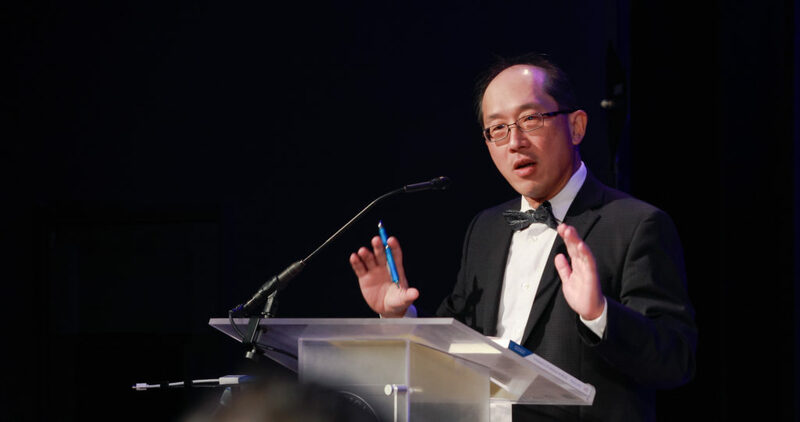 Yong came to Fuller in 2014 from Regent University School of Divinity, where he taught for nine years, serving most recently as J. Rodman Williams Professor of Theology and as dean. Prior to that he was on the faculty at Bethel University in St. Paul, Bethany College of the Assemblies of God, and served as a pastor and worked in social and health services in Vancouver, Washington. Last week, the United Methodist General Board of Global Ministries, in collaboration with Candler School of Theology of Emory University in Atlanta, hosted a conference on “Answering the Call: Hearing God’s Voice in Methodist Mission Past, Present, and Future.” The conference celebrated Methodism’s mission heritage and looked to the future of Methodist mission. Some of those present with ties to Boston University included (from Left to Right): David Scott (’07), Michele Sigg (’18), Dr. Dana Robert, Rich Darr (’05), Doug Tzan (’13), Lisa Beth White (’08), Ben Hartley (’00 & ’05), Jack Amick (’06), & Mikio Miyagi (’10). This roundtable will examine the functions of sacred objects in three very different Jesuit missions from the sixteenth to nineteenth centuries – England, China, and Northeastern America – to compare the devotional, social, and sometimes political significance that sacred objects acquired in different geographical and cultural circumstances. The event will feature an exhibit of relics and sacramental objects from the Boston College Burns Library’s Liturgy and Life Collection, a unique collection of historical devotional materials donated by Catholic communities across the United States. On April 6, 2019, Andrew Walls, Dana L. Robert, and M.L. Daneel met in New Haven, Connecticut. The contributions to Mission Studies by each is significant, but the friendship among them is what endures. From 26 to 28 March 2019, the University of Notre Dame (Indiana, USA) hosted representatives of the five Christian world communions formally associated with the Joint Declaration on the Doctrine of Justification (JDDJ) to discuss implications of that landmark agreement in the context of growing closeness and collaboration between them. Church leaders came from the Roman Catholic Church, the Lutheran World Federation, the World Methodist Council, the World Communion of Reformed Churches, and the Anglican Communion. Participants at the consultation recognized the urgency of presenting afresh the core message of the JDDJ that “by grace alone, in faith in Christ’s saving work and not because of any merit on our part, we are accepted by God and receive the Holy Spirit, who renews our hearts while equipping and calling us to good works.” They stressed the relevance of this gospel message for our conflicted and wounded world. The representatives discerned further steps on the journey toward deeper ecclesial communion and a more visible common witness. Challenged with showing the deeper bonds that have been developing over the past two decades, the group welcomed the 2016 “Lund Imperative” to act always from the perspective of unity rather than from the point of view of division. The participants also affirmed the method of differentiating consensus that allows for agreement on common convictions while maintaining different confessional expressions. The purpose of the meeting was not to achieve theological breakthroughs, yet participants were able to discuss key issues of mutual recognition of ministry, highlighting ways of strengthening cooperation in pastoral ministry and social outreach. The group discussed the need for strategies to address the connection between justification and justice, and proposed the production of a range of common resources such as catechetical tools. Together participants encouraged the strengthening of the common bond of baptism in ways appropriate to local contexts. The participants recognized the need to apply the 1952 Lund Principle, which calls them to act together in all things except when significant differences of conviction compel them to act separately. To continue the conversation, the participants decided to set up a steering committee to carry forward their ongoing work. The members of the Consultation expressed gratitude for the generous hospitality shown by the University of Notre Dame which enabled them to move forward together on their journey. It was their prayer that the Holy Spirit bring to completion what God has begun. Nicolette Manglos-Weber’s new book, Joining the Choir: Religious Membership and Social Trust Among Transnational Christians was published by Oxford University Press, and recently reviewed by the American Academy of Religion’s Reading Religion. Nimi Wariboko, the Walter G. Muelder Professor of Social Ethics, has recently published a new volume: Ethics and Society in Nigeria: Identity, History, Political Theory. This pathbreaking book constructs a socio-ethical identity of Nigeria that can advance its political development. Its method is based on the rediscovery of the practices and principles of emancipatory politics and a retrieval of fundamental virtues and capabilities that go to the core of the functioning of pluralistic communities. Ethics and Society in Nigeria: Identity, History, Political Theory critically engages history, myth, political philosophy, and religion to demonstrate that Nigeria has an unfolding historic identity that can serve as a resource for sustaining increasing levels of human flourishing and democratic republicanism. Located at the intersection of history and political theory, this work identifies the nature of Nigeria’s moral problem, forges the political-theoretic discursive framework for a robust analysis of the problem, and shows a pathway out of the nation’s predicament. This three-pronged approach is founded on the retrieval of moral exemplars from the past and critical engagement with history as a social practice, philosophical concept, discipline of study, form of social imaginary, and witness of the flows of contemporary events. Using this methodology, author Nimi Wariboko analyzes various forms of political, religious, and revolutionary identities that have been put forth by different groups in the country and then examines their usefulness for the transformation of Nigeria’s problematic socio-ethical identity. April 8-10, Global Ministries of the United Methodist Church will sponsor a conference to commemorate the 200th anniversary of Methodist missions. The theme of the conference is “Answering the Call: Hearing God’s Voice in Methodist Mission Past, Present, and Future.” The event will celebrate Methodism’s mission heritage and look to the future of Methodist mission. It will be held in Atlanta, Georgia, USA, at the Emory University Conference Center Hotel. The dates for the conference were chosen to coincide closely with the 200th anniversary of the founding of the Missionary Society on April 5, 1819, formed to support the work of John Stewart, a free African-American, among the Wyandotte Native American people of Ohio. David Scott (’13) is organizing the event and three people from the CGCM will be presenting at the conference: Dana Robert, Michele Sigg, and Mikio Miyagi.